...bound in genuine leather with accents of 22kt gold. Easton Press was established in 1975 as a division of a company known as MBI, Incorporated, a company formerly known as Danbury Mint. Founded by Ralph Glendinning and Ted Stanley in 1969, Danbury Mint specialized in direct marketing of commemorative items that were designed to "hit the heartstrings of America in easy-to-arrange monthly installments" (Hoover online financial reports). In a series of publishing buyouts in the mid-1970s, MBI acquired the rights to books formerly published by George Macy (b. 1900 - d. 1956) under the Heritage Press and Heritage Club banners, which also included some of Macy's exclusive and initially expensive Limited Editions Club volumes. The Limited Editions Club volumes featured limitation numbers and autographs by the illustrators. Macy's Heritage Club editions were textually identical but had no limitation numbers, were not autographed by the illustrators and featured different bindings. With a mailing list that has been estimated at 10 million names, MBI was well-established to launch a publishing business that featured formerly pricey limited editions. Easton Press issued a number of Mark Twain's works in various bindings. 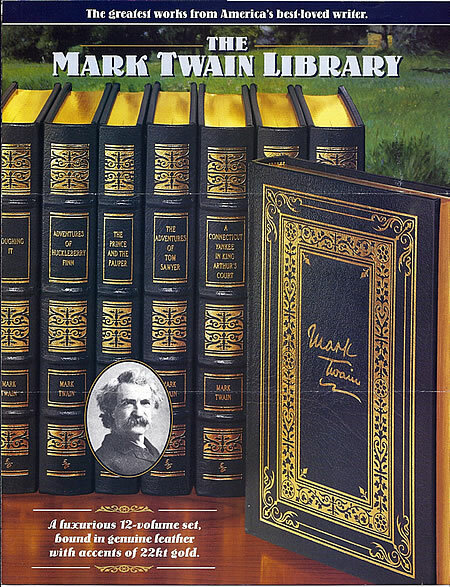 However, they have only issued one Mark Twain collection in a uniform edition. These books were marketed via a plan similar to the one implemented by John Alun Stevenson in the 1930s with the American Artists edition of Mark Twain's works as well as Greystone Definitive Edition in the mid-1960s. 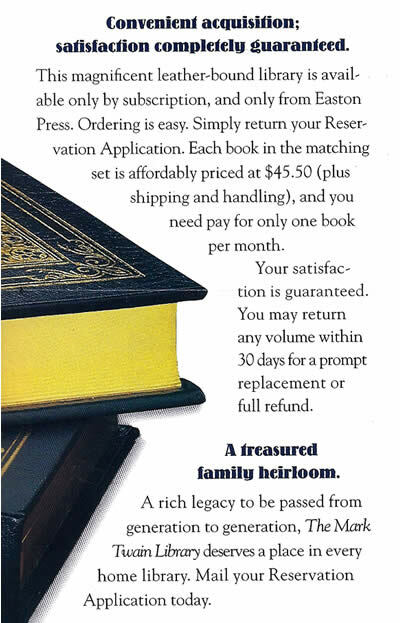 Sold by direct marketing and subscription sales techniques featuring monthly payments, Easton Press aimed for consumers who desired books bound in leather and gold with all the trimmings--books that decorate a room. Customers reserved their sets ahead of publication and were allowed to pay for one book per month and return any volume within thirty days. Price per book was $45.50. A complete set, if all twelve volumes were accepted, would total $546. The volumes included in this collection are an eclectic mix of twelve volumes. Eight titles were previously issued under George Macy's publishing umbrella. Three titles had been previously published by the University of California Press. One was a random collection of previously published Mark Twain works unique to this edition. The books feature no volume numbers and are listed here in order of their initial appearance from previous publication. Adventures of Huckleberry Finn, Edited with an introduction by Bernard DeVoto, illustrations by Thomas Hart Benton. Noted American artist Thomas Hart Benton was born in1889 in Missouri and died in that state in 1975. Benton had previously illustrated an edition of The Adventures of Tom Sawyer for the Limited Editions Club in 1939. Benton's illustrated edition of Huckleberry Finn first appeared in 1942 under the Limited Editions Club imprint. Life on the Mississippi, introduction by Edward Wagenknecht, illustrations by Thomas Hart Benton. Noted American artist Thomas Hart Benton was born in1889 in Missouri and died in that state in 1975. Benton's illustrated edition of Life on the Mississippi first appeared in 1944 under the Heritage Press imprint. The Innocents Abroad, introduction by Edward Wagenknecht, illustrations by Fritz Kredel. Kredel was born in Germany in 1900 and died in New York in 1973. He had previously illustrated Mark Twain's Slovenly Peter for Harper and Brothers in 1935. The Innocents Abroad with Kredel's illustrations first appeared in the 1962 Limited Editions Club and Heritage Club editions published by George Macy. The Prince and the Pauper, introduction by Edward Wagenkneckt, illustrations by Clarke Hutton. Clarke Hutton was born in 1898 in London and died in 1984. He was an illustrator of English books as well as a teacher at Central School of Art in London. His illustrations for The Prince and the Pauper first appeared in the 1964 Limited Editions Club and Heritage Club editions published by George Macy. A Tramp Abroad, introduction by Edward Wagenknecht, illustrations by David Knight and Mark Twain. This edition with Knight's illustrations first appeared in the 1966 Limited Editions Club and Heritage Club editions published by George Macy. Roughing It, with an introduction by Edward Wagenknecht, uncredited illustrations. The Limited Editions Club and Heritage Press edition of Roughing It first appeared in 1972 with eleven color plates, several of which were double spreads, by artist Noel Sickles and numerous smaller black and white illustrations. Sickles was born in Ohio in 1910 and died in Arizona in 1982. He was a commercial and illustrator best know for his comic strip "Scorchy Smith." When Easton Press published this edition of Roughing It, Sickles's full page plates were dropped and no illustrator is credited for the remaining illustrations. Pudd'nhead Wilson, introduction by Edward Wagenknecht, illustrations by John Groth. John Groth was born in 1908 in Chicago and died in 1988 in New York. A former art director for Esquire magazine and war correspondent for the Chicago Sun newspaper, he had previously illustrated Mark Twain's The War Prayer for Harper & Row (1968). His illustrations for Pudd'nhead Wilson first appeared in the edition published for George Macy's Limited Editions Club and Heritage Club editions in 1974. The Adventures of Tom Sawyer, Foreword and notes by John C Gerber, text established by Terry Firkins. The University of California Press licensed leatherbound reprint rights to this title to Easton Press on May 11, 1998, and the signee for Easton Press was Roy Pfeil, Publisher/Easton Press. The contract did not indicate the size of the initial printing. This title had originally appeared in the Mark Twain Library series in 1982 with original illustrations from the first edition by True Williams. Tom Sawyer Abroad/ Tom Sawyer, Detective, Foreword and notes by John C Gerber, text established by Terry Firkins. The University of California Press licensed leatherbound reprint rights to this title to Easton Press on May 11, 1998, and the signee for Easton Press was Roy Pfeil, Publisher/Easton Press. The contract did not indicate the size of the initial printing. This title had originally appeared in the Mark Twain Library series in 1982 with original illustrations from the first editions: Daniel Carter Beard for Tom Sawyer Abroad and A. B. Frost for Tom Sawyer, Detective. A Connecticut Yankee in King Arthur's Court, edited by Bernard L Stein. The University of California Press licensed leatherbound reprint rights to this title to Easton Press on May 11, 1998, and the signee for Easton Press was Roy Pfeil, Publisher/Easton Press. The contract did not indicate the size of the initial printing. This title had originally appeared in the Mark Twain Library series in 1983 with original illustrations from the first edition by Daniel Carter Beard. "George Macy Companies: Limited Editions Club & The Heritage Press." Accessed 5 August 2013. Heyman, Randy. Personal correspondence 22 July 2013. Majure, Bill R. "A Brief History of the Limited Editions Club." Accessed 5 August 2013. "MBI, Incorporated Company Profile from Hoovers." Accessed 5 August 2013.